I spent New Year’s weekend watching favorite movies, and among them, I dusted off my copy of Arsenic and Old Lace, starring the wonderful Cary Grant, directed by the equally wonderful Frank Capra. Cary Grant plays Mortimer Brewster, whose two aunts are simply the kindest, sweetest, loveliest little old ladies you could ever want to meet. They collect toys for children, they give a hot meal to anyone who needs it, and they poison lonely old men as a charity, by putting arsenic in elderberry wine. They just want to give the poor dears peace, you see. Mortimer is stunned to find a dead body in the windowseat, and tries valiantly to explain to his aunts that this is not a nice thing to do. Happening almost in real time, the rest of the movie covers one night as Mortimer tries to get control of a situation that increasingly unravels around him. This is black comedy at its best, macabre and ridiculous, and so absurd that you can’t be horrified. And the laughs come pretty constantly. As the sane man in a crowd of lunatics, Mortimer is the guiding force of the movie (and it does lose something for a while in the middle when he leaves the scene for twenty minutes or so). Much as I love him, Cary really only had two roles in his movies—Suave Cary and Bumbling Cary. 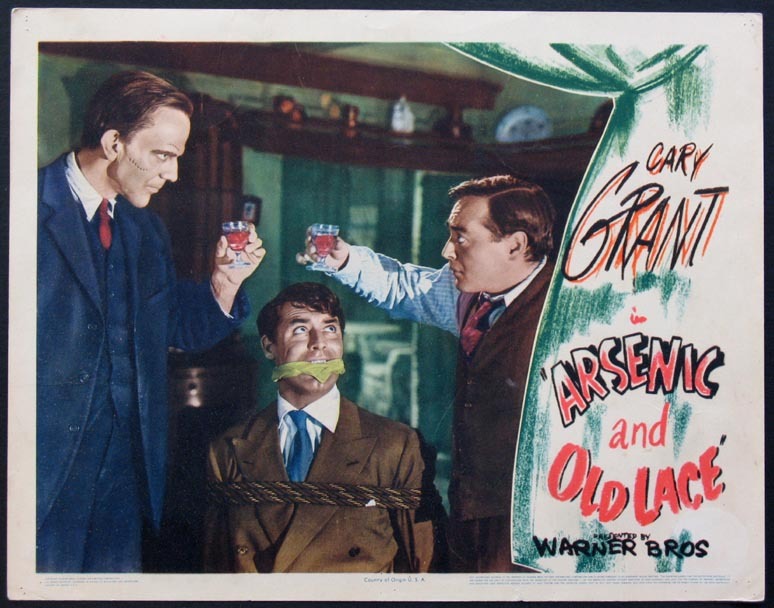 Arsenic and Old Lace gives us both of them, as Suave Cary faces a situation that launches him so far out of his depth that he turns into Bumbling Cary. As funny as so much of this movie is, it’s Cary Grant’s double-takes that really make the movie for me. The two aunts are just the beginning of the crowd. They also have another nephew, Teddy. He believes he’s Theodore Roosevelt (with a remarkable grasp of his own biography, including the chapters that haven’t happened yet). He yells “Charge! !” every time he goes up the stairs (because it’s San Juan Hill, you see), helpfully digs graves for his aunts in the basement (digging locks for Panama), and accepts every new body as a Yellow Fever victim. Teddy is the perfect example of why this movie works: it’s completely mad, but it’s internally consistent. Teddy’s delusions are perfectly logical and historically grounded, while making no sense at all. The aunts never break their sweetness even while discussing murder. When a second body turns up in the windowseat and Mortimer struggles to believe his aunt that she didn’t kill this one, she indignantly declares that she would never stoop to a fib. So where did the second body come from? There’s also a third brother, Jonathan, the black sheep of the family who was creepy even as a child. He disappeared years ago and now shows up unexpectedly, with a story of murders across the globe, with Dr. Einstein as his smarmy sidekick, and with a body of his own. Dr. Einstein is played by the wonderful Peter Lorre (who essentially is my definition of smarmy—I can only define it by referencing Peter Lorre). Raymond Massy plays Jonathan, and is excellent and spooky…but you have to know the casting history to get one of the best Jonathan-jokes. Jonathan got a new face (when Dr. Einstein gave him plastic surgery while intoxicated), and is repeatedly compared to Boris Karloff “in that monster movie.” He flies into murderous rages at the suggestion…which is all so much funnier when you know that Boris Karloff played the role of Jonathan on Broadway. I’d recommend it! Although humor is SO subjective…it might not be your style. Worth a shot though! Cary Grant was a genius at this type of comedy. His timing was spot on and the reactions he had to the other characters were perfect. He did the same thing with Katharine Hepburn in “Bringing up Baby,” playing the straight man to her crazy character. He never won an Oscar for a particular performance (got an honorary one for his whole body of work, though he was nominated twice for dramatic roles), but if the Academy nominated actors for comedies (which they usually don’t) they should have singled him out for this one. I wish they would nominate comedies for Oscars! It would make the ceremony far more interesting. Bringing Up Baby is another of my favorites! I love this movie! Mortimer is so hilarious how he doesn’t want his aunts to get in trouble but is horrified at what’s going on. I adore this movie. It’s just so good. And, now I want to watch it right now! It’s definitely one I had to own, to have ready to watch! This is one of our favorites, and we generally watch it every Halloween night. We were in the old movie mode over Christmas and pulled out Bringing Up Baby and Holiday, two other favorite Cary Grant films. He was such a great actor, especially in these quick-witted comedies. The casting of this film is brilliant, and the Aunts especially crack me up, in a macbre way. I’d love to see this on stage some day, it would be fun to see it live with an audience.